Vivaldi updated to latest version 1.5, bringing support for smart-home lighting integration, bulk tab commands, add page screenshots to Notes and more. The main goal of the Vivaldi project is to make a highly flexible, low on resources and extremely fast web browser software that works across all mainstream computer operating systems including Linux, Mac OSX and Microsoft Windows, a web browser that is rich in functionality and designed for you. 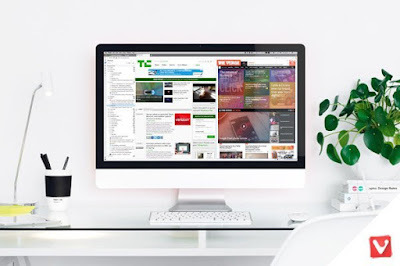 If you looking for other browsers as Mozilla Firefox, Google Chrome, or Chromium alternative for your Linux desktop, Vivaldi is worth to try. You can now select multiple tabs, apply commands to them in bulk, and drag the selected tabs into stacks. You can even drag tabs between windows on your desktop. Notes is a built-in tool that lets you capture your thoughts while you browse. The tool lives in your browser side panel and is the perfect way to grab quotes, screenshots and make note of links without leaving Vivaldi. Along with performance improvements, accessibility of content according to your reading preferences has also been enhanced by by adding a reader mode button to the address bar. They are giving users the ability to go beyond the browser and into the smart home by integrating with Hue color lights from Philips. Selecting which lights Vivaldi should control, the browser will synchronize your physical surroundings with the color of the web. Anyone who's survived a not-so-fast connection understands the frustration of slow moving updates. This means that the next time you click update, you will only download and install parts of Vivaldi that have changed. Check out the video below to see Vivaldi in action! For more details and complete changelog, you can see this page. What's next? Open vivaldi via Ubuntu unity dash, or similar app launcher like Synapse Launcher. You can also grab it by head to Vivaldi Offcial Page.